Home STUDIO A great bead store in Chiang Mai! 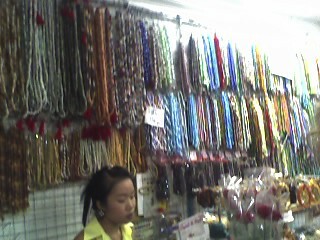 A great bead store in Chiang Mai! Oh no!!! BEADS!!!! Our guide Jeff who absolutely rocked brought us to his own neighborhood and local market where he introduced us to a friend with a bead shop. We walked down a narrow road and alley ways to get there. What fun to see so many unique beads and many we had never seen before. There were a number of Hill Tribe replica pieces done in Tibetan Silver that we bought as well as a few funky findings and cats eye glass beads around 15mm across! I love love love celadon!!!! You two look like you are having too much fun! Just popped in to say “hi”! Have fun and you two stay out of trouble! Oh you guys are having such fun! I was in Chang Mai back in 2000 and I just thought it was heaven. Enjoy the smiles and sunshine! Awesome beads. Wish i could have been there for that. Sandy, I knew you would want to know that Bill B. got back to back Group 1’s over the weekend at the Greenville KC shows with Paul! They weren’t tiny shows either. Paul looks great! Sounds like you are having the time of your lives!! Jim was in on Sat at work and I realized that I wasn’t getting any updates from you ( I thought I would get updates thru my email but I guess I was wrong). I followed back through your blog today and it looks like a blast 🙂 Freezing cold here, blowing snow, etc… Maybe this will all be gone by the time you get back Diana! Woooo Hooooo…hi everyone!!!! Oh boy I’ll start from the top..
Hey my glass guru Leah!!!!! I remember years ago you told me about Chiang Mai. Never did I think I would actually get here . I will say HI to the Elephants for you!! HEY Jim!!!! I’ll have Diana write too…she’ back in the room right now but it’s awesome to see you here!! Your weather sounds just awful….We will bring some sunshine back I promise..OH here’s Diana…Hi there Jim. Sounds as if you were snowed in at the house??? Cathy was saying there was no way they would have made it to the Keomah show in DM. Don’t overdo the snow shoveling—let the machine do all the work. It is warm and humid here. Give all the furries a pat for me and Kipper a big hug. I miss the fur, but have found enough cats that want to be petted here to keep the homesickness for my animals at bay. Bonnie….Wooo Hoooooo Thank you for the update on Paulie. I’m so excited!!!!!!! Give Ikie a kissie for me!!! Sorry to hear you all are fighting Iowa winter, You would HATE the weather here—NOT!! Did the clinic have to shut down at all? Jim said our road is one way and a big blower is coming for HWY 14. We’re taking pictures of our HEAT^ so would someone take pictures of your freezer for me? We are having a great time. Went to Celadon studio yesterday and watched the artists hand make each piece. Up into the hills to an awesome temple-and we were blessed by a monk. More info later. Today it’s off for our trek-raft ride-and hike in the hills. Hopefully seeing kids to share the crayons with. Where is this store??? ?I live in Chiang Mai and need to find a bead store! !